Ice skating on The Square, a 70-strong choir on the High Street, a helter skelter behind the church, a saxophone band at the market and Morris dancers outside Starbucks. These were just some of the attractions that turned Market Harborough into a winter wonderland at the Christmas Fayre on Friday night. An estimated crowd of about 5,000 people packed the town centre for a thoroughly enjoyable event. Fayre committee chairman Sofi Vaughan said: “I would like to thank everyone who made the Fayre such a success. 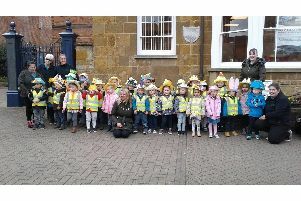 And Harborough Chamber of Trade and Commerce vice-president Alastair Campbell added: “It was great to see so many people in town – busier than previous years I thought. Across the heaving town centre, stallholders and entertainers were delighted by the evening. “We just wanted to support the event,” said John Pacey of brass quintet Jubilee Brass, who were playing outside Joules Clothing in High Street. On The Square, Owen Brooks of radio station Harborough FM, said: “It’s amazing, especially considering the committee only had a few weeks to bring it all together. So what did Harborough’s permanent shops think? Some were happy with trade on the night, while others see the Fayre as a chance for visitors to weigh up the town’s shops rather than actually do their shopping. “Yes, people have been buying. It’s been a great evening,” said Diane Simpson, on the Mark Evans Jewellery stall at Harborough Market. At Rapport on Manor Walk, Liz Rackham said: “It’s a day for children and families. “My worry is that as you get more attractions in the street, so the footfall in the shops becomes less,” said Martin Abbott of clothes shop Josiah’s in High Street. Meanwhile, Fayre committee chair Sofi Vaughan is already thinking ahead to next year’s event. “If we can do that in eight weeks, we should be able to do even better in 364 days” she said. “I’d love to be involved again next year.